Our world seems to be dramatically changing as global politics heads from a unipolar system to a multipolar one. As the British spymaster Alex Younger pointed out recently money, power and technology are shifting toward the East. Obviously, it brings about a cold climate in global politics. New economic and technological developments are affecting not just local but global players as well. On the point of shifting, France has become one of the countries drawn into almost a kind of civil war. I think we can say three matters are at the forefront of the turmoil in French politics today: The security of Europe, the security of energy production and the financial restructuring of the economy. Raising fuel taxes and launching devastating measures against the middle and working class in order to finance French ambitions to adapt to a new world order in the age of transformation are beginning to show their contradictions. Also, the future of President Emmanuel Macron, a young and energetic president backed by global bankers to fight various difficulties, is an enigma just like the future of France. Can his administration weather the storm? In 1886, Herbert von Bismarck wrote from Paris to his father, German Chancellor Otto von Bismarck in Berlin that many important people in the French capital, like the Rothschild family, hold the idea that the next great war in Europe may break out between England and France. However, the crisis would end up in an Anglo-German war, not a fight between France and England, in 1914. France, after fighting Germany in the two World Wars, together with the U.K. and the U.S., was at the table to share global energy resource planning. By the 1950s Western interests, namely the security of European energy supply and socio-economic stability was backed and maintained thanks to American contributions. But Paris was unhappy with the London-Washington axis, which considered ruling out French interests many times. The anti-American Charles de Gaulle’s government gave Algeria independence to secure French interests in North African energy resources, took France out of NATO command, and launched a great project of nuclear energy production infrastructure. In the 1960s, nuclear France started producing electricity. France saved its energy security and limited its role in the NATO structure, too. In the Cold War era, the de Gaulle administration challenged the allies and “saved France” this way. However, the 1968 riots in France caused a fear of social and economic collapse. Next year, de Gaulle would end his political career after a 1969 referendum declined constitutional reforms. During his presidency, France had launched nuclear energy investments to halt dependency on oil. Although France was not subjected to the Organisation of Petroleum Exporting Countries (OPEC) embargo in 1973, the government took heavy measures such as limiting TV broadcasts, heating and communication services. The construction of nuclear plants began rapidly. Rothschild-backed Georges J. R. Pompidou replaced de Gaulle but the latter’s heritage would continue in French politics for decades. Macron: A young de Gaulle or no one? The Donald Trump administration’s “America First” policy prioritizes keeping American money holders in the U.S. and investing in the U.S. Washington has also declared its withdrawal from the Paris Climate Accord on behalf of American energy companies. The Federal Reserve hiked rates that strengthened the U.S. dollar in global markets. Trump has also told NATO allies to pay more for the common defense organization and they should not lay the burden on Americans. This policy affected other U.S. allies naturally, triggering the unrest in France. 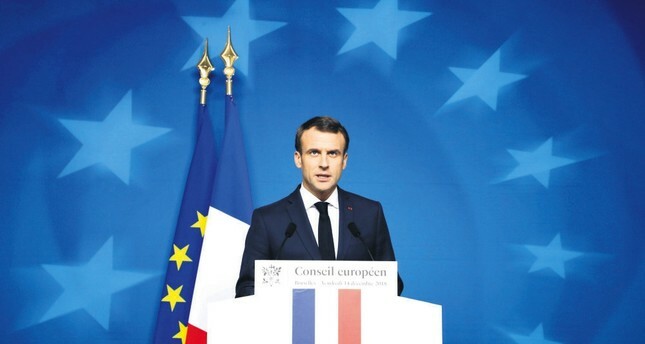 French strategy planners have seen the world heading toward a multipolar system and have started thinking of the need to develop a European security system in embracing a future world free from an U.S.-dominated NATO. Because the U.S. government is pushing allies to lift NATO’s burden, in terms of meeting the expenses together, it requires France to set a supplementary budget. However, with around 10 percent unemployment, France has been dealing with an economic burden in the last decade. Signing the Paris Agreement in 2016, French policy was determined to rely on investing in renewable energy and, especially after conflicting with Trump over NATO, the French have suggested plans of developing projects to finance European security, as the country is the biggest military power of the EU. The future security of France depends on its role in NATO, which it returned to in 2009 just before the war in the Middle East, the so-called Arab Spring, started. And on the economy, to be recovered by pressing on the lower class and supporting the bankers’ appetite for risk. As for energy security, Macron plans to develop an almost oil-free renewable energy sector, like France had developed in the nuclear field before, by putting additional taxes on diesel fuel along with measures to prevent plastic production which potentially shaped the established market in the beginning. However, David René de Rothschild, the French member of his global family and Macron’s ex-boss, said “One cannot be the Mozart of anything after one year,” in an interview with Financial Times. Ironically the streets clashes began in November, on the anniversary of the decision of London-based European Banking Authority (EBA) headquarters’ move to Paris as Britain prepares to quit the EU. The rich and global investors support Macron because he is their hope of keeping France in the EU, to slow down the already rising rightist discourse. However, French billionaire François Pinault told Le Monde last June that Macron hardly understands the poor. Matthieu Pigasse, CEO of Lazard in France, known for his support of leftist politicians in the country and who has considerable influence on Le Monde-like French media, has similar views.